Every author I know tackles writing differently. Some set targets, some write four drafts, some hand-write in green fountain pen on legal pads. I returned to fiction after thirty years of writing research papers and management reports, and I seem to have carried over the habits of economy and what I call ‘live’ editing into my practice*. That means that I write a single draft, editing back and forth as I go along. A single draft? Correct. I don’t write 120,000 words and then start cutting from the beginning until I’m down to 80,000. 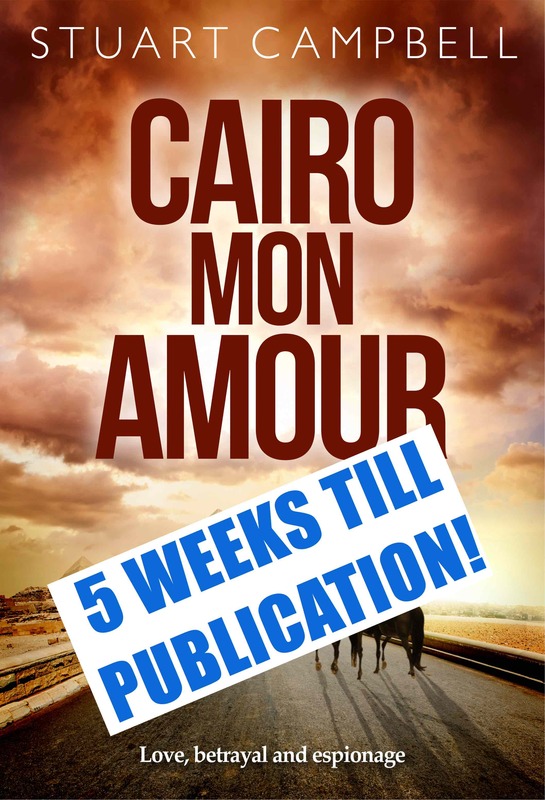 My Word file for Cairo Mon Amour was a living, quivering thing, like a garden in spring. As it spread in all directions, I pruned a branch here, pulled up a stunted shrub there, planted an exotic species here and waited to see what would happen. The magic ingredient is my weekly writers group at the NSW Writers Centre. I read chapters to my wonderful buddies, soak up the criticism, and go home to revise. I can’t imagine writing any other way. People ask me “Do you have the whole plot worked out in advance?” Not really. To use another botanical metaphor, I think of the writing process as walking in a forest where I can see a hundred metres in front of me (i.e. about three chapters), but the thick trees conceal what is beyond (the next six chapters). I have a good idea what’s beyond the hill (the ending). So for me, writing a book like Cairo Mon Amour is really exciting. I start by getting four or five characters established, put them in a jam, and then see what happens next. Often the book starts to write itself: I may think I know what is going to happen, but suddenly another path appears (the forest metaphor again). It’s exhilarating, high-risk, unpredictable. I never have writer’s block. I just listen to my characters, and they show me where to go. With Cairo Mon Amour, I didn’t know exactly how it would end until I was eighty-percent through. I then wrote the ending and filled in the last twenty percent. I read a lot of advice about having dedicated writing time, a favourite chair, a routine, meditation. The trouble is that I was an extreme multi-tasker in my professional career, and I can’t kick the habit. My desk is in a room with two doors, that functions as a rat-run between the kitchen and the bedrooms. I write in short bursts between cooking, grandparenting, exercising, and my consulting work. By the time I get to my Mac, I’ll have written the next two thousand words in my head during a walk to Forty Baskets Beach. Then I actually write it down. Often, an obscure phrase from the past will suddenly generate a whole chunk of text. Years ago in Malta, I was on the track of my hero King Roger II of Sicily (1095-1154). An old churchwarden booted the tourists out of an ornate Baroque church to give me a private tour when I mentioned my quest. “A beautiful church,” I said. “And rich in history,” he solemnly replied. I put the same words into the mouth of the French priest in an unadorned church in a damp village where my characters Pierre and Zouzou ask to be married. “Rich in history,” he says, gesturing at the gaunt rafters. But of course, Pierre and Zouzou’s experience of Egyptian churches is all gold ornament and opulent robes. I feel a little embarrassed about my confession. Perhaps I should buy a fountain pen. *One of my research specialisations was on the cognitive processes in translation between languages. I developed theories on different modes of processing depending on the difficulty of the task at hand. If you are game, have a look at: Stuart Campbell, Ali Aldahesh, Alya’ Al-Rubai’i, Raymond Chakhachiro, Berta Wakim (2010) “Information structure management and textual competence in translation and interpreting: Sentence openings in translation from Arabic into English as a second language” in Baker, Mona, Olohan, Maeve and Perez, Maria Calzada (Eds.) Text and Context: Essays on Translation and Interpreting in Honour of Ian Mason. Manchester: St Jerome, p.27-58. If I had a spare five years, I’d explore the same phenomena in creative writing.